Beezie Madden and Coral Reef Via Volo. Photos By: V. Valenti/The Book LLC. Miami, FL – April 5, 2014 – Tonight, history was made as the 42nd Gene Mische $200,000 American Invitational, presented by G&C Farm, found its new home at Sun Life Stadium in Miami, FL. The class has become a landmark of the showjumping world, and tonight was no exception as 29 horse and rider combinations gathered on the field to compete in a battle of the best. It was an electrifying night as spectators looked on to the stadium turf, but it was with swiftness and accuracy that Beezie Madden was able to emerge as the victor tonight. Aboard Coral Reef Via Volo, Madden rode to her third American Invitational victory, a feat few can claim. 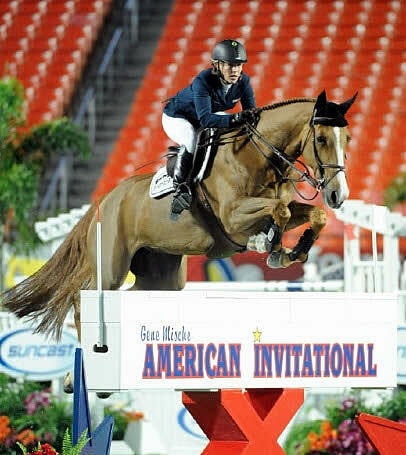 Madden navigated Coral Reef Via Volo to a double-clear effort during a five-horse jump off. They tripped the timers in 35.91 seconds after completing a clear short course, while Meredith Michaels-Beerbaum and Atlanta rode to the second place for the only other double clear effort. Lauren Hough and Ohlala were the third place finishers, taking the honors as the fastest of the four faulters after lowering the height of obstacle 17, an oxer set near the in gate. Designer of the 2008 Olympic courses, Steve Stephens of Palmetto, FL, designed tonight’s toilsome track. The 13 numbered obstacles featured a triple bar-oxer double combination, a scopey vertical leading into the oxer-liverpool combination, a unique, suspended American Invitational wall, a skinny, a blue, square oxer and a daunting G&C Farms final oxer. The most difficult obstacle proved to be the double combination coming off of the Miami Dolphins oxer, resulting in numerous rails on the ground. Hough and Ohlala were the first to traverse the opening track, showing the way as the eleventh to take on the course. The crowd erupted into a resounding applause as she showed that it could be done. Madden guaranteed a jump-off only two rounds later, crossing the finish line without fault. 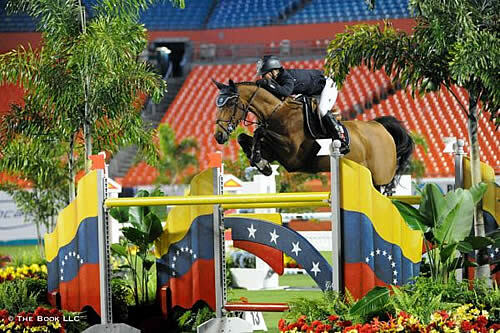 Brazil’s Rodrigo Pessoa and Citizenguard Cadjanine also rode to a clear effort, while Meredith Michaels-Beerbaum rode Atlanta to the fourth slot of the short course. It was Miami’s own Margie Engle, aboard Royce, who filled the fifth position, leaving the audience on the edge of their seats. With a jump off eminent, the stakes were high as riders entered into the seven-obstacle track. Their eyes were set on the prize, but Stephens’ course left much to be determined on the turf. Hough was the first to return, and although she was very quick early on, her approach to the final oxer sealed her fate as a four-faulter with Ohlala. They completed the course in 34.44 seconds. Reining Longines FEI World Cup Show Jumping Champion, Beezie Madden, took her turn with Coral Reef Via Volo. She posted a more conservative effort than her counterparts, but her intent was clear: accuracy over speed. Using Coral Reef Via Volo’s stride to her advantage, and knowing her mount’s weaknesses, she followed her plan for the jump off and broke the beam without fault in 35.91 seconds. Madden secured the victory on Authentic in both 2005 and 2007, but since his retirement, Madden’s talented string of mounts has stepped up to shine. Although Pessoa attempted to catch Madden, four faults at the opening oxer of the double and a fault at the penultimate obstacle would earn him the fifth place position tonight. It wasn’t until Michaels-Beerbaum returned to the field that defeat seemed possible. The German rider was aboard a more recent mount, Atlanta, and although this was only their second time competing under the lights and their first time in a jump off, they proved that with time they could become unstoppable. They cleared the course in 38.02 seconds without touching a rail. Margie Engle was the final rider to go against the clock, but her choice to do eight strides to the second fence cost her the clean round she was hoping for. She ended on four faults in 36 seconds, finishing in the fourth place position. Pessoa would pick up fifth, while Shane Sweetnam and Eregast Van Kizelhoff rounded out the top six as the fastest of the four-faulters from the first round. Madden is the fourth rider to ever take home three victories from the American Invitational. Although Madden has quite the string of horses, tonight was Coral Reef Via Volo’s time to shine under the lights, and she stepped up for the challenge.